Why is nobody watching in the game? Get ready for six-story Dak. 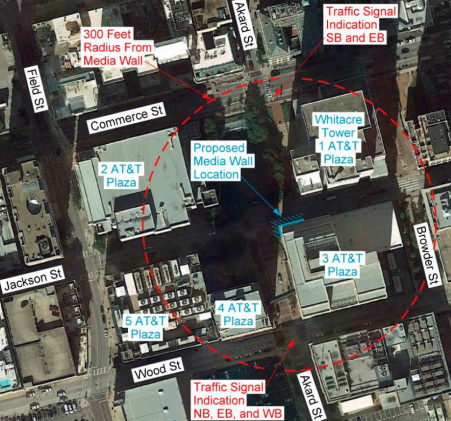 If you’re just joining us, AT&T has pledged to throw $100 million behind renovations of the area connecting its handful of downtown skyscrapers, which it’s calling the Discovery District. The urban core’s massive corporate tenant is planning for trees, green space, fountains, a sculpture, and places to eat and drink. It also wants a giant video board, six stories and 9,300 square feet in all. On Thursday, the City Plan Commission signed off on the specs. 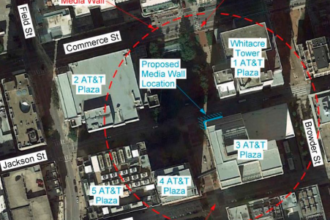 The biggest point of contention: just exactly what AT&T plans to broadcast. Murphy wanted to make AT&T come back for re-approval after a certain number of years, just to ensure everything was running as planned. But she was all alone in her dissent. Staff had been concerned about allowing AT&T to put anything they wanted on the board under the nebulous term “content.” But commissioners added the word “media”—as in, “media content”—and called it good. Most took comfort in a provision that AT&T won’t get to sell time to third-party advertisers. Of course, AT&T has been known to mess around and drop a cool $70 million on its own TV ads in a month, and that was before it owned a movie and TV factory. So, there are plenty of its own ads to go around. The company is selling the video board as a way to draw people to the district. Joe Trampel, an associate director of technology, ran through a few of the uses: broadcasting Cowboys games and the AT&T Byron Nelson, movie nights, clips of various films made special to fit the entirety of the display, which bends around the corner of the building. The board will go mostly dark after 1 a.m. during the week and 2 a.m. on weekends, allowed to use only 5 percent of its total capacity for brightness until morning; AT&T plans to have a starry night up on the screen. The company brought with it to the planning meeting sign-offs from the nearby Magnolia and Adolphus hotels. It purchased the nearby Interurban Building earlier this year. 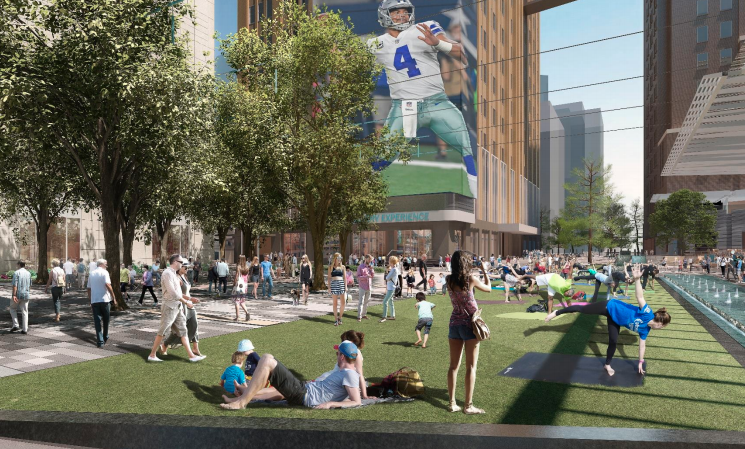 “By and large we do see and hear support for the project,” said Kourtny Garrett, the CEO of Downtown Dallas Inc., who dropped by to speak in favor of the media board. She said DDI’s vision of downtown is that it’s a “place for action” and “energy,” and that this would support those goals. This story has been updated to correctly identify the commissioner who dissented.